Here’s a striking native perennial that isn’t included in nearly enough northern gardens, particularly when one considers that with proper care and culture it’s hardy to USDA Zone 2. Lobelia offers an extremely uncommon appearance, and lends a stately, sophisticated air to the proceedings. The top eight inches of the prominent main stem(s) is covered with small spikes of brilliant, rich red flowers from mid- to late summer; the plant always draws comments from visitors to my garden. OK, so it’s not the easiest plant to grow. That doesn’t make it difficult. It’s enough, however, for many nurseries and garden centers to place it in their “One Dead Return Too Many” doghouse. So you may have to order it via the mail (check out my column Best Minnesota Perennial Growers; virtually all offer mail-order). But you, comrade, can grow Lobelia. It simply involves gardening. 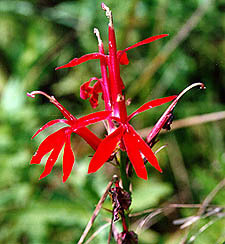 Care and Use: A woodland plant, Lobelia grows in sun to part shade and reaches heights of four feet. It prefers soil high in organic matter and likes to keep its feet wet, so one use is along natural streams and ponds, as well as beside the water garden. Amend the soil by adding plenty of compost and/or peat moss, plus coarse sand or pea gravel to ensure decent drainage. If no water setting is handy, use it at the back of the perennial bed just as you would tall phlox, then remember to water it twice a week (comparable to Astilbe or Ligularia) during periods of no rain. Provide a mulch in the summer to retain moisture. Concerning its reputation for not lasting more than a year or two, preparing the soil as described above and not allowing it to dry out completely (gardening) will do much to improve its longevity, as will dividing it every year. Lift the plant in September after bloom, remove the outside clusters of new basal growth, and replant them in rich soil. Water them in and keep them moderately moist until frost. Mulch the “mama” plant and her babies with a good eight inches to a foot of marsh hay or bags of leaves after the ground freezes. The plant also self-seeds readily, so in combination, you should have plenty of nice specimens around each year. A blue variety, L. siphilitica, is less demanding to grow, and takes more of a bush form. But Prince didn’t name his song “Little Blue Corvette.” Red, as all humans know, is where it’s at.